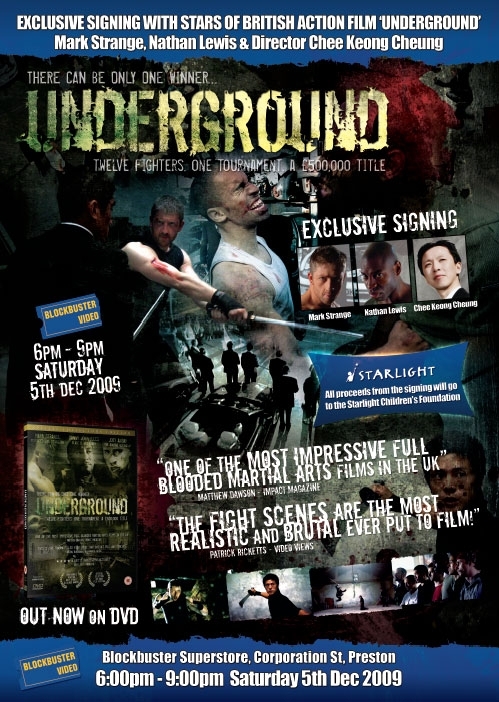 Underground follows the journey of twelve fighters, hand selected to compete in a no-holds-barred martial arts competition for a £500,000 prize. With a dazzling display of unrestrained martial artistry and a wide range of disciplines on offer, Underground re-examines the ‘kumite’ martial arts genre that gained popularity during the 1980s and turns it completely on its head. The film also features some of the UK’s most impressive and exciting martial arts and action talent. In Bodyguard: A New Beginning, a loyal bodyguard to a Hong Kong gang boss is sent to the UK to protect a woman amidst escalating violence between rival Hong Kong gangs. As teams are sent to intercept the pair, the bodyguard faces his greatest challenge; ensuring the woman’s safety and fulfilling his mission of escorting her back to Hong Kong. The film co-stars screen legends Cary-Hiroyuki Tagawa from Mortal Kombat and Planet of the Apes and Richard Ng, best known from the Lucky Stars films starring Jackie Chan! Both these new and exciting independent British Action Films are available on DVD in the UK on the Action Extreme label. Produced by people who are passionate about action cinema, these two independent films are not to be missed. Nathan Lewis is a three time World Kick Boxing Champion and four time British Kick Boxing Champion, as well a former British National Kung Fu Champion. He remains active in the world of martial arts and has many credits working in film and television as both a screen fighter and stuntman. Prior to working on Underground and Bodyguard: A New Beginning, Nathan fought alongside Mark Strange in Christopher Nolan’s Batman Begins. Proceeds from the signing will be donated to the Starlight Children’s Foundation. Starlight Children’s Foundation brightens the lives of seriously and terminally ill children by granting their wishes and providing hospital entertainment to help take their minds off the pain, fear and isolation of their illness. Since beginning in 1987, the charity has changed the lives of families all over the UK. Visit Starlight’s website http://www.starlight.org.uk or call Starlight on 0207 262 2881 to learn more about the charity, to hear our recent news and to check ways in which you can help transform the lives of seriously and terminally ill children. 6:00pm – 9:00pm Saturday 5 December 2009. This is a scene taken from the British fight film UNDERGROUND, which is now available to buy nationwide in the UK at Amazon.co.uk, Play.com and high street HMV stores. In an increasingly voyeuristic and oppressive society, a new form of reality entertainment is sweeping the country. Taking place in undisclosed locations across the country, filmed and streamed over the internet and watched by a select live audience. Some take part for entertainment, some for the chance of a better life… underground, no hold barred, prize fighting. This is reality entertainment to the extreme. In the UK suburbs, an underground tournament is set to challenge twelve fighters from different backgrounds to compete for the prize of £500,000. They have been handpicked for a no-holds barred competition that will push each fighter to their limit. …but there can be only one winner. Question: What is the prize money that Mark Strange’s character and the other eleven competitors are fighting for? Please email your answers to info@fightnub.com and make the subject ‘Underground Competition’. The runner up will receive an un-signed copy of the ‘Underground’ DVD.